Do you have questions or comments about weather radio? Use this link on the main NWS web site to submit your questions or comments. KIH-61: Omaha,NE." - 162.400 MHz - Serving the Omaha Area with a transmitter in Omaha, NE. WXM-20: Lincoln, NE.- 162.475 MHz - Serving the Lincoln area with a transmitter site in Lincoln, NE. WXL-77: Carrol, NE. - 162.550 MHz - Serving the Norfolk area with a transmitter site near Carroll, NE. KWN-41: Shubert, NE. - 162.500 MHz - Serving south-eastern Nebraska with a transmitter site near Shubert, NE. KZZ-69: Beatrice, NE. - 162.450 MHz - Serving the Beatrice area with a transmitter site in near Beatrice, NE. WNG-549: Columbus, NE. - 162.450 MHz - Serving the Columbus area with a transmitter site near Columbus, NE. WNG-645: Albion, NE - 162.500 MHz - Serving the Albion area with a transmitter site near Cedar Rapids, NE. KZZ-50: Essex, IA. - 162.550 MHz - Serving southwestern Iowa with a transmitter site near Essex, IA. KZZ-52: Hancock, IA. - 162.525 MHz - Serving the Hancock area with a transmitter site near Hancock, IA. WXL-62: Sioux City, IA. - 162.475 MHz - Serving northeast Nebraska and northwest Iowa, originating from NWS Sioux Falls, with a transmitter site near Lawton, IA. KXI-25: Pickstown, SD. - 162.425 MHz - Serving Pickstown area, originating from NWS Sioux Falls, with a transmitter site near Pickstown, SD. WNG-668: Crawford, IA - 162.550 MHz - Serving northeastern Iowa, originating from NWS Des Moines, with a transmitter site near Denison, IA. These broadcasts originate from local National Weather Service (NWS) offices across the United States. As the Voice of the National Weather Service, weather radio provides continuous broadcasts of the latest weather information. Known as the "voice of the National Weather Service," NWR is provided as a public service by the Department of Commerce's National Oceanic and Atmospheric Administration. The NWR network has more than 900 stations in the 50 states and adjacent coastal waters, Puerto Rico, the U.S. Virgin Islands and U.S. Pacific Territories. Broadcasts can be heard as far away as 40 miles from the antenna site. However, the effective range depends on several factors, including the terrain, quality of the receiver, and current weather conditions. NWS Weather Radio provides dependable and timely weather information at your fingertips. From day-to-day weather forecasts to warnings of deadly storms, NWR is always available, 24 hours a day, 365 days a year. The broadcast schedule consists of messages which are repeated every three to five minutes and are routinely revised to provide up-to-date information. During severe weather or other potentially hazardous events, the regularly scheduled programming is interrupted to substitute severe weather (including warnings, watches, etc.) or other hazardous informational messages. Special NWR receivers can be activated, sounding an alarm indicating that important information soon follows. Tests of the warning alarm are normally conducted by NWS Omaha every Wednesday around 11:15 am local time. NWR can also be used to alert you to non-weather related emergencies, such as earthquakes, toxic or chemical spills, national attacks, or nuclear blasts. Many local retailers or electronics stores sell NWS Weather Radios. To purchase a NOAA All Hazards Weather Radio, check with your local electronics shop or check out our NWR Receiver Consumer Information page. The National Weather Service encourages everyone to use weather radio to receive life-saving warnings and other information from the National Weather Service in Omaha. The warning alarm precedes tornado and severe thunderstorm watches, and tornado, severe thunderstorm and flash flood warnings, as well as other emergency messages, and is designed to activate specially designed weather radio receivers, providing audible and/or visual warning signals to homes, schools and businesses in the path of the storm. Normal Programming Schedule for Weather Radio Transmitters in NWS Omaha's area. Local 7 Day Forecast - Valid For the NWS Weather Radio listening area. Hourly Weather Roundup - Summarizes current weather conditions for cities in Eastern Nebraska and Southwest Iowa. Regional Weather Discussion - A discussion of local weather conditions. Updated as often as necessary to reflect changing weather conditions and to enhance the local forecast. Hazardous Weather Outlook - An outlook to any hazardous weather over the next 7 days with a focus on the next 24 hours. Climate Information - Includes temperatures and rainfall, climatological normals, and accumulations. Severe Weather Watches, Warnings, and Statements - Important information regarding the location and movements of severe thunderstorms, including damaging winds, large hail, and/or tornadoes. Flood/Flash Flood Watches, Warnings, and Statements - Important information regarding the location and movement of heavy rain and flash flood producing thunderstorms and weather systems. Winter Weather Watches, Warnings, and Advisories - Important information regarding potential hazardous winter weather. Non-Precipitation Warnings and Advisories - Important information regarding potentially hazardous weather conditions not associated with precipitation, such as wind chill, heat, non-thunderstorm high winds, fog, frost, and freezes. New technology is now available in NWS Weather Radio that allows you to obtain only the warnings, watches, and other information you want. This technology, called the Specific Area Message Encoder (SAME), broadcasts the same information we always have had, but adds a code that enables specially built receivers to receive only the information the you want. Thus, you can receive severe weather warnings, watches, and statements for the only county in which you live, if desired, and not information for other counties in the overall NWR broadcast area. 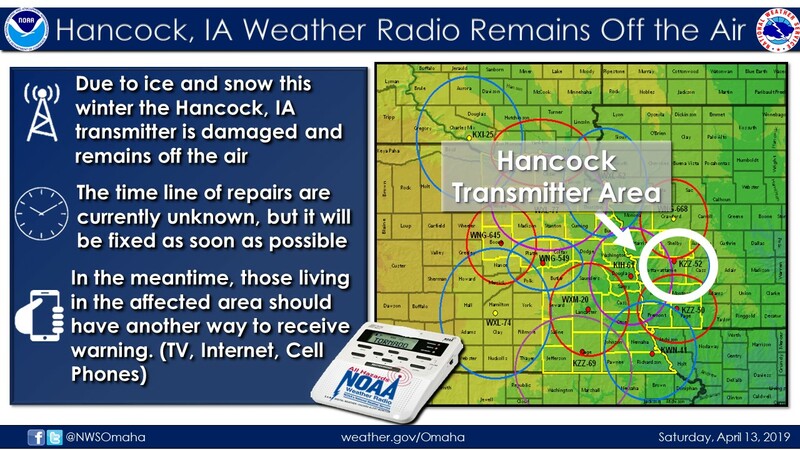 All current and older model NWR receivers will receive all information from the NWS, but only radios with the SAME capability can be programmed to receive only information for specific counties. Since the SAME codes are fully compatible with the FCC's Emergency Alert System, it is possible in the future that new television sets, pagers, cellular telephones and other electronic devices will be able to receive these SAME coded messages. These new receivers are available at local electronics stores in your area. If you have purchased a new weather radio with the SAME capability and want to program it for specific counties in your NWR listening area, you will need the proper county codes (FIPS). For any state in the U.S..
NWR broadcasts are automated, using a computerized voice. This personal computer-based broadcasting console, known as the Console Replacement System (CRS), automates the process of reading written information for broadcast on NWR. CRS automatically translates written NWS forecasts, warnings, and observations into synthesized-voice messages and schedule them for broadcast on NWR. This automated system provides faster broadcasts of severe weather watches, warnings, and emergency information over NWR because multiple warnings can be recorded and transmitted at once. This capability dramatically speeds up the broadcast of warnings during multiple severe weather events. CRS brings many benefits to the NWR network. Automating the process makes it easier for listeners to tune to NWR at particular times for the information they need. Forecast offices are able to broadcast particular forecasts and information, such as river forecasts or climate summaries, in time slots on a more regular schedule. In addition, updated hourly weather conditions always are recorded at the same time every hour, and forecasts and warnings are recorded and transmitted simultaneously. These capabilities allow NWR to be your most dependable source for accurate and up-to-date weather information.